It’s just a good reminder to cherish the time that we have with our fur babies because they certainly aren’t with us long enough. I did some searching online and found some really cute gift ideas that are perfect for dogs! I hope that it will give you some inspiration if you want to get your dog a present this Valentine’s Day, too. Heart Dog Collar: Get them looking festive with this adorable heart dog collar. It comes in a variety of different designs and colors. 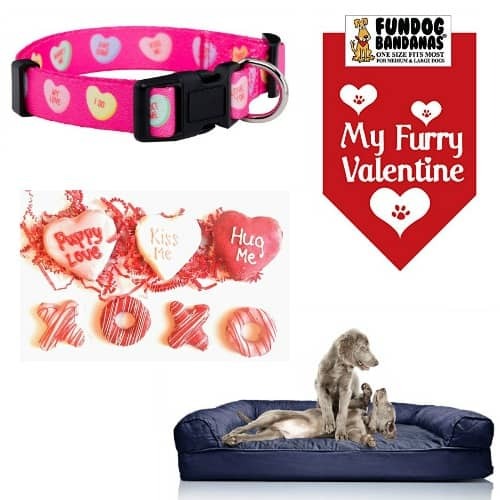 FunDog Bandanas: If your dog hates wearing clothes, you can still dress him/her for the holiday with these cute Valentine’s Day dog bandanas. There are over 10 styles to choose from. 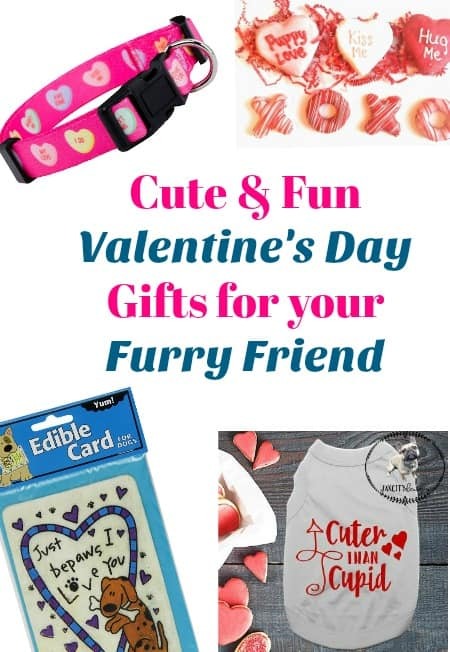 Valentine’s Day Dog Treats: My dog loves treats! These would be perfect for a Valentine’s Day treat. 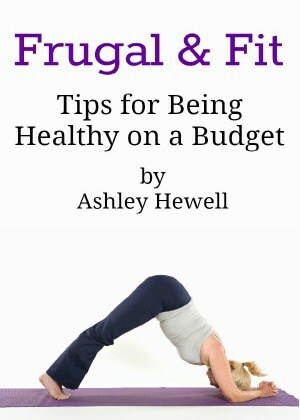 They are made in the USA and feature a honey oat recipe with yogurt icing. Orthopedic Dog Couch: Give them a comfortable place to lounge, instead of your lap, of course, with this dog couch! This is great for dogs with joint problems and comes in several different designs and colors. 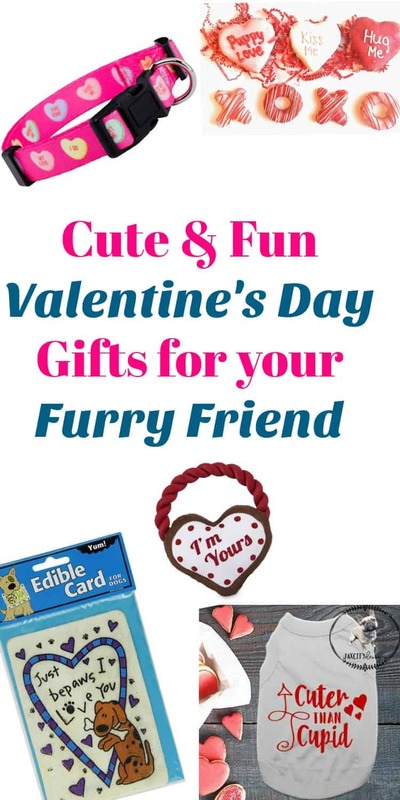 Edible Card: Give your pooch an actual Valentine….that they can eat! I love these Crunchkins Edible Cards. They have them for every occasion, including Christmas and birthdays. Dog Bed Heating Pad: We used this for our older dog during the winter because she would get so cold. She loved having the Snuggle Safe in her bed. Plus, it is a lot safer than an electric one. Valentine’s Toys: What dog doesn’t love a new toy? Petco has a lot of cute Valentine’s Day dog toys to choose from. My favorite is the “I’m Yours” rope toy. Valentine’s Dog Shirt: JaxCityDesigns has some really cute dog shirts. You can get them personalized with a name or any saying you want. My favorite is the Cuter than Cupid shirt! Go Fetch in a Bucket: I love the cute Go Fetch in a Bucket gift that Personal Creations has. It’s a personalized bucket full of fun red balls for your dog to play with. Don’t forget to get yourself a little something, too! 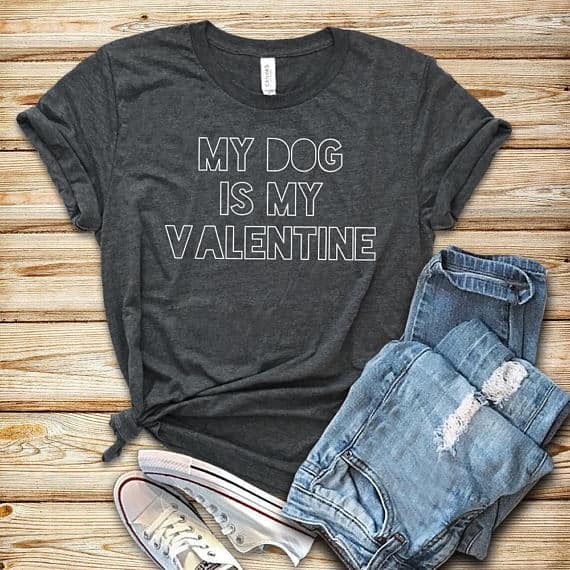 This Valentine’s Day tee is perfect for any dog lover. I think I might get one for myself! 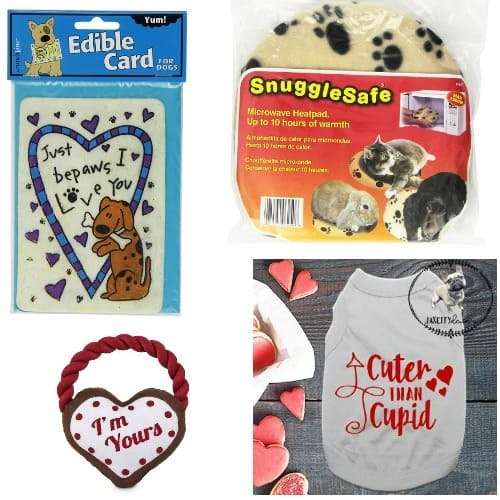 Do you have any traditions you do with your pets or Valentine’s Day gifts for dogs that you give every year?